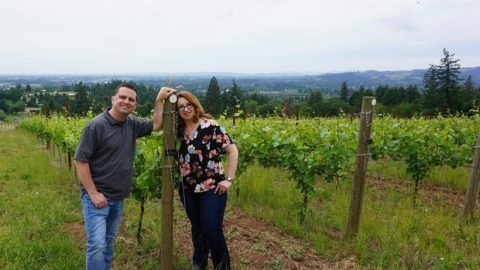 This post is for everyone who’s ever wondered—privately or out loud—why on earth in the middle of a recession I’d tell my husband to quit the successful career that made him miserable, pack up, and move 2500 miles away to start a winery in a valley that already has 400 of them. The answer can be distilled down to one word: Kelly. Who was Kelly Lynn Armstrong Palmer? 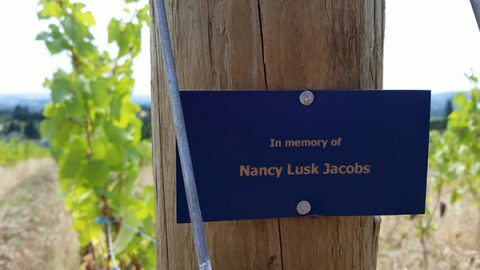 She’s more than just a plaque on the first post of the first row of the first block of our vineyard. Actually, I talk about her a lot when I’m telling the story of how Bells Up Winery came to be. Initially, she was my dear friend and professional mentor for many years. As a mentor—first at a business-to-business ad agency in Cincinnati, and later when I hung out my own freelancer shingle—Kelly shared a lengthy list of tips for succeeding in an industry dominated by old, white men (it was still a very “Mad Men” world in that field, even in the late 1990s). Planted in 2014: Row 1 of our new vineyard, planted to honor the memory of Kelly Lynn Armstrong Palmer, who wasn’t afraid to take a chance, and gave so much in her 40 short years on Earth. This one’s for you Kel. Make a change—big or small. Helpful pointers, to be sure. For example, I was well beyond “working for assholes” by 2008. But some of them, notably “take a risk,” “make a change—big or small” and “don’t be afraid,” I hadn’t quite been able to take to heart. That’s because Dave and I were struggling with a lot. Trying to start a family and failing epically, repeatedly and publicly as I endured three miscarriages in 13 months—two were late term. Dave had devolved from disenchanted with the legal career he had started a decade before (and was incredibly successful at) to a miserable shell of his former self, unhappy and stressed out all the time. Our marriage was crumbling, truth be told. Posts (and plaque) added in 2015. And the blue tubes came off too. Grow little Pommard vines, grow! On the recommendation of our marital counselor (yes, I dare you to keep a marriage together under such horrific circumstances without outside help), we started making wine in the basement as a “cute, couple-y hobby.” I liked drinking the wine and making the labels. Dave was fascinated by the entire process, and “our” hobby quickly became “his” hobby. Wine started to dominate our vacations too. Then, shortly after we returned to Cincinnati from that vacation, Kelly called. She had been diagnosed with Stage 4 pancreatic cancer, just two weeks after her 40th birthday. In short order, our daughter was born right before Christmas 2008, and at the start of 2009, Dave—under tremendous pressure from his bosses to go the partner track in a legal career that he now hated so much it made him physically sick—essentially had a nervous breakdown. Oh, and the economy was in the middle of a recession. I decided that I was done: Done with chasing the suburban dream, done with tiptoeing through a struggling marriage to a miserable spouse, done with “what if,” done with fear. 2016: Kelly’s row of Pommard vines, shown here reaching for the heavens. Next year we hope to make our first estate wine with them. Meanwhile Kelly was fighting. At first for her life, then for one more day. She tried surgery. She tried treatments. Throughout all that she fought for more awareness of pancreatic cancer, doing newspaper and radio interviews even when the pain medications made it difficult for her to hold a train of thought long enough to complete a sentence. She had so much to live for. Three beautiful kids, the love of her life, her amazing extended family around the world, dear neighbors and friends. Cancer didn’t care. Kelly lost her fight on June 30, 2009. Not a single day passes that I don’t think about her. Today, obviously, more than the other 364 days on our global trip around the sun. And now that I’ve passed her in the number of years I’ve been on this planet, I think how incredibly unfair life is, and I appreciate every opportunity we’ve made and chance we’ve seized in this Bells Up adventure. So it made perfect sense to honor Kelly’s memory with the very first row of vines planted in the very first block of our very first (and last) vineyard. They were planted in 2014, marked with posts in 2015, and have really taken off in 2016. I like to think they’re reaching heavenward—up to Kelly. Peace out. Love you Kel. 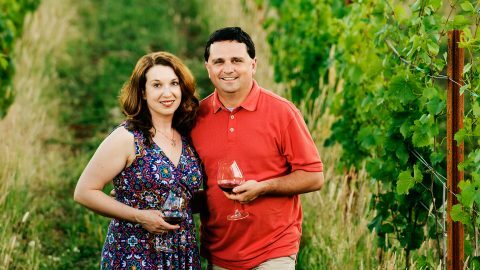 When a Fanfare Club member is also a professional photographer, you get amazing event photos like this...Bells Up returns to Northwest Fresh Seafood for wine tasting on July 14.